Fabien van Mook, October 2013. Figure 1 shows the schematic of a LED flasher circuit. It works on one 1.5 V AA battery and makes a bright LED flash every second or so, during more than a half year. The electric energy of the battery is thus used in a very economic way. Figure 1. The original circuit for the LED flasher. Figure 2 shows one of the about 6 LED flashers, which I built from the schematic on ordinary solder board since January 2009. Often I use even two batteries and thus feeding it with 3 V. To make the flashing light more visible, a plastic (light conducting) tube is put on the LED. Figure 2. A LED flasher version on solder board of February 2009. In September 2013 I designed a printed circuit board with help of Fritzing. Four such boards (with all holes drilled) were manufactured at MijnPrintplaat.nl. Figure 3 shows a printed circuit board and two mounted LED flashers. There are mainly two ways by which the LED can be mounted. Figure 3. A printed circuit board and two mounted LED flashers. 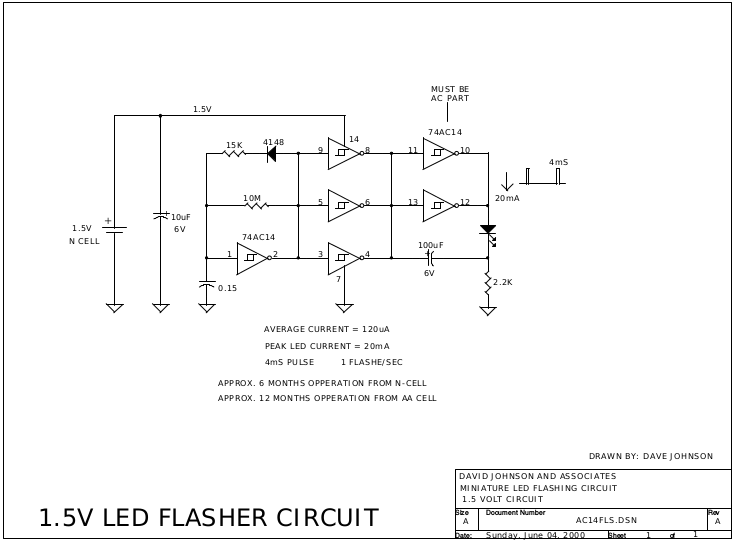 The original LED flasher circuit by Dave Johnson: http://www.discovercircuits.com/H-Corner/led-flasher.htm.